My daughter does a flip turn at the other end of the pool. 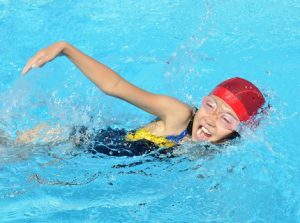 Screaming erupts among teammates, competing teams, parents and coaches as she and the swimmer next to her break the water’s surface in unison. My daughter rises higher, her arms out wide before whipping them forward to dive under the surface again. I am hoarse from yelling. I can’t help myself. My girl, my child with special needs, has come so far and overcome so much. I am her biggest cheerleader. Never did I imagine that I would have a child with special needs. I imagined a brood of “normal” kids. I ventured into parenting with prayers and dreams of perfection. Please don’t judge me. I am being honest here. Special needs was a wild card, an unfamiliar and distressing spectrum of unknown territory. Special needs frightened me. I was sure I did not have it in me to parent a child with special needs, granted I had no idea what it might take. Adopted from China at the age of 12 months, she was truly sick and out of sync. Institutionalization just about broke her. Even though my daughter did not speak for close to three and a half years, she communicated what she needed. Along with signing, we had our own special language. I learned to listen with more than my ears and to be aware of more than the spoken word, such as what her unique movements meant. She showed me that her thumb was the best pacifier; naked was better than clothes; and that playing in the dirt and watching nature was fascinating. She was tender with ants, worms and snakes. Curious and fearless, she held them without crushing their small bodies. When the time arrived to gently strip her pudgy hands of her “friends,” she erupted into keening. Although I took care to replace them with baby-safe insects, she was not fooled. She quickly taught me that holding her skin-to-skin and heart-to-heart calmed her outbursts and de-stressed Mama. Indeed it was during these countless holding sessions that I absorbed the miracle of my daughter, memorized the millimeters of her porcelain skin and downy dark hair. I didn’t get much done those two and a half years, other than basic care and parenting and general domestic duties and cooking. My daughter gave me many clues, but without a diagnosis, I was unable to meet all of her needs. I tried, oh how I tried. I loved my daughter before I held her in my arms. I was determined to leave no stone unturned. Despite an initial screening and several follow-ups, specialists provided no diagnosis other than “significantly delayed.” They were divided on whether she would or could catch up. I refused to believe them. My gut told me the specialists were missing something big, but of course, I had no idea what it was. I began to journal about my daughter’s behavior (unpredictable, no pattern), outbursts (constant), setbacks (many), likes and dislikes, movements (“odd”) and milestones (few). Close to being out of options, I scheduled another appointment and took my notes. Upon entering the therapy group’s office that day, hope pounded in my throat and prayers pooled in my eyes. I remember my daughter shifting in my arms so that she could look me in the eyes. Her sweet smile seemed to say, “We’ve got this.” She snuggled back into my chest, tucking her soft hand under my bra, resting over my heart, while we waited to begin. The 30-minute appointment turned into several hours as other specialists screened my daughter. We waited patiently. Per usual, my diaper bag was bursting with snacks, milk, and toys. Fortunately, I had also packed her lovey, Snakey—a stuffed snake longer than her. My girl resorted to sucking her thumb as time ticked by, next to the comfort of Snakey. Excited voices grew louder in the room next to us. One therapist came to get us and took us into that room. The team gave us a diagnosis and outlined a plan for a battalion of therapies, which my girl began the following day. Therapy would not taper off for close to six years and would help my daughter and teach me more about supporting her as she became whole. My daughter touches the wall first. No one screams louder than me. She turns and finds me in the bleachers. Pride and satisfaction light her smile. I smile back so hard my face hurts, and I raise two thumbs us. You got this, babe. Judy M. Miller savors time with her kids. She is a Certified Gottman Educator and the author of several books.